The Adobe Black Friday deal has just leaked and just as we predicted, it's the same sale that they had last year. From now until Friday November 24th, you can save 20% off on Adobe's Creative Cloud which gives you access to a ton of Adobe's creative apps, plus brand new tools for UX design, 3D compositing, and much more. There is one small catch with this sale though - it's limited to new customers only! So, if you've never tried Adobe's Creative Cloud and you're interested in using the latest version of Photoshop, Illustrator, etc. then now is the time to buy it. The 2019 Adobe Black Friday deals have not yet been released. While we don't have the Black Friday ad for Adobe.com yet, below are some of their historical deals which will give you a good indication of what you can expect during this year's sale. The Adobe Black Friday savings started on Thanksgiving morning during Black Friday in 2014. They were offering up to 68% off their Creative Cloud software subscription plans which included updated desktop apps, all-new mobile apps, Creative Cloud Libraries, and much more. 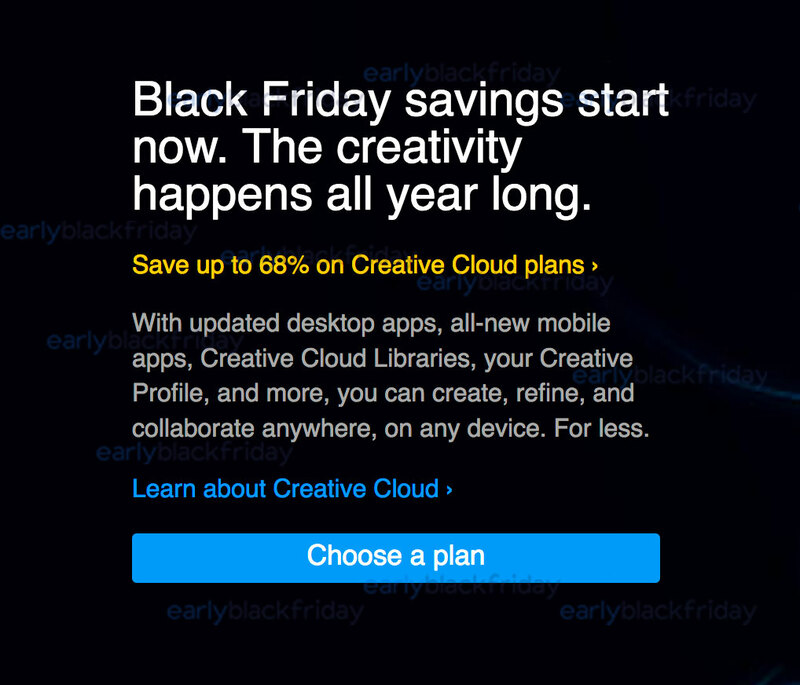 The deal lasted only on Thanksgiving day and on Black Friday itself so if you're interested in renewing or subscribing to Adobe's Creative Cloud, Black Friday is the time to do so!